Review by Frits van Zandbergen, Posted on 19-08-2011, 3 Stars. 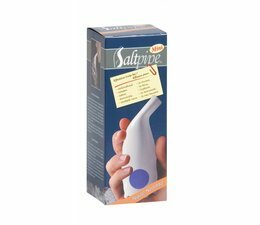 It was a spontaneous article in the "tip of the reader" of a patient with COPD who are already half a year has a lot of benefits from the Salt Pipe (see www.saltpipe.nl), the porcelijnen inhaler with Halit salt from the ancient mountains on the border of Hungary and Romania. This product has been more than 5 years in our range and many people with breathing problems (such as asthma, COPD, allergies, snoring, anxiety, etc) used this product for many with "relief". For more information http://www.direct-help.nl/nl/gezondheid/ademhalingsproblemen. From time to time we all had the following common diseases, which cause a lot of discomfort, such as catch a cold, cold, cough, nasal congestion, bronchitis, flu symptoms, runny nose, allergies or asthma. Nowadays there is a variety of treatments available to reduce these symptoms or treat. Fortunately, there is a natural "treasure" that brings lasting relief: natural rock salt Halit. Treatment with these 20 million year-old species unique salt brings fast relief and can also play a significant preventive role. The beneficial effect of rock salt on the respiratory system has been known for centuries, but has recently been proven again through clinical studies and well-documented medical experiences. The secret curative value of this rock-salt is in the salt particles are very small, transmitted through the air, which, if inhaled, respiratory organs purify, soothe and restore. The Halit salt, in the Mini Salt Pipe, but also in porcelain Salt Pipe (Adults) and Solefant (for children) is used, carefully selected from the most famous and healing salt caves in Europe. Therefore, the condition of the patient with ademhalinsgproblemen can be greatly improved. Instructions Place the Mini Salt Pipe with Halit original salt in your mouth and inhale. Exhale through the nose. The normal breathing can continue with the same intensity without any extra effort. In acute cases, it is advised to use the Mini Salt Pipe, spread over 3 to 4 applications use and then 4-5 minutes at a time. Daily 15 to 25 minutes As soon as the cleaning process is started, it overgetollige mucus can leave the breathing system by coughing, and by the discharge of the nose. The rest of inhaling the Halit salt crystals leads to a cleaning process in the lining of the respiratory system and helps the body's natural cleansing process. The Halit salt also helps in eliminating germs and viruses. Recent studies have shown that the Halit-salt has a balanced effect on the immune system. Recommended by the National Federation of Hungarian Pharmacists Active ingredients of this product: Halitzout NaCl: 99.20%; CaSO 4: 0.40%; MgCl 2: 0.08%; CaCl 2: 0.08%; Fe 2 O 3: 0.001% After opening this product contains active ingredients that are sufficient for the use of 3 to 6 months, depending on the intensity of use. Cleaning: clean the exterior only with a damp cloth and keep the inside dry. Store in a dry place.